Hawker Hunter ("lovec") je bilo britansko reaktivno podzvočno lovsko letalo iz 1950ih. Uporabljal se je kot lovec, lovski bombnik, jurišnik in izvidnik. Dvosedežne verzije so se uporabljale tudi kot trenažerji. Zgrajeno je bilo skoraj 2000 letal, ki so jih izvozili v 21 držav. V uporabi je bil skoraj 60 let, zadnje vojaško letalo so upokojili leta 2014, nekaj letal še vedno leti. ↑ "Hispano SURA R80 rockets." Flight International. 30 August 1962, p. 159. ↑ Napaka pri navajanju: Neveljavna oznaka <ref>; sklici poimenovani AFM67 ne vsebujejo besedila (glej stran pomoči). Arce, Luz. The Inferno: A Story of Terror and Survival in Chile. Madison, Wisconsin: University of Wisconsin Press, 2004. ISBN 0-299-19554-6. Bahl, Taru and M.H. Syed. Encyclopaedia of the Muslim World. New Delhi, India: Anmol Publications Ltd., 2003. ISBN 81-261-1419-3. Bradley, Paul. The Hawker Hunter: A Comprehensive Guide. Bedford, UK: SAM Publications, 2009. ISBN 0-9551858-9-0. Braybrook, Roy. "Hunter ... Thirty Years Young". Air International, Vol. 21, No, 1, July 1981, pp. 20–29. Bromley, UK: Fine Scroll. ISSN 0306-5634. Chesneau, Roger. 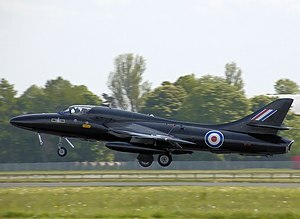 Hawker Hunter F Mk 6/T Mk7 - Aeroguide 9. Linewrites Ltd, 1985. ISBN 0-918805-08-2. Geiger, Till. Britain and the Economic Problem of the Cold War: The Political Economy and the Economic Impact of the British Defence Effort, 1945-1955. Aldershot, UK: Ashgate Publishing Ltd, 2004. ISBN 0-7546-0287-7. Griffin, David J. Hawker Hunter 1951 to 2007. Morrisville, North Carolina: Lulu Enterprises, 2006. ISBN 1-4303-0593-2. "Hawker Hunter." Vliegend in Nederland 4 (in Dutch). Eindhoven, Netherlands: Flash Aviation, 1990. ISBN 978-90-71553-09-7. Jackson, Robert. Hawker Hunter: The Operational Record, Volume 31. Washington, D.C.: Smithsonian Institution Press, 1990. ISBN 0-87474-377-X. Jackson, Robert. Modern Combat Aircraft 15, Hawker Hunter. Shepperton, Surrey, UK: Ian Allan, 1982. ISBN 0-7110-1216-4. James, Derek N. Hawker: Aircraft Album No. 5. New York: Arco Publishing Company, 1973 (First published in the UK by Ian Allan in 1972). ISBN 0-668-02699-5. Jeshurun, Chandran. The Growth of the Malaysian Armed Forces, 1963-73. Singapore: Institute of Southeast Asian Studies, 1975. Kavic, Lorne J. India's Quest for Security: Defence Policies, 1947-1965. Berkeley, California: University of California Press, 1967. Lake, Jon. "Hawker Hunter". Wings of Fame. Volume 20, 2000. pp. 28–97. London: Aerospace Publishing. ISSN 1361-2034. ISBN 1-86184-053-5. Law, John. Aircraft Stories: Decentering the Object in Technoscience. Durham, North Carolina: Duke University Press, 2002. ISBN 0-8223-2824-0. Lefebvre, Jeffery A. Arms for the Horn: U.S. Security Policy in Ethiopia and Somalia, 1953-1991. Pittsburgh, Pennsylvania: University of Pittsburgh, 1992. ISBN 0-8229-8533-0. McLelland, Tim. The Hawker Hunter. Manchester, UK: Crécy Publishing Ltd., 2008. ISBN 978-0-85979-123-6. Mohan, P. V. S. Jagan and Samir Chopra. The India-Pakistan Air War of 1965. New Delhi, India: Manohar, 2005. ISBN 81-7304-641-7. Nordeen, Lon O. Air Warfare in the Missile Age. Washington, D.C.: Smithsonian Institution, 1985. ISBN 978-0-87474-680-8. Phythian, Mark. The Politics of British Arms Sales since 1964. Manchester, UK: Manchester University Press, 2000. ISBN 0-7190-5907-0. Rolland, John C. Lebanon: Current Issues and Background. New York: Nova Publishers, 2003. ISBN 1-59033-871-5. Senior, Tim. The Air Forces Book of the F/A-18 Hornet. Minneapolis, Minnesota: Zenith Imprint, 2003. ISBN 0-946219-69-9. Smith, Chris Nicholas. India's Ad Hoc Arsenal: Direction Or Drift in Defence Policy?. Oxford University Press, 1994. ISBN 0-19-829168-X. Sieff, Martin. Shifting Superpowers: The New and Emerging Relationship Between the United States, China, and India. Washington, D.C.: Cato Institute, 2009. ISBN 1-935308-21-1. Skardon, C Philip. A Lesson for Our Times: How America Kept the Peace in the Hungary-Suez Crisis of 1956. Bloomington, Indiana: AuthorHouse, 2010. ISBN 1-4208-9102-2.